Citation: Baskaran R, Natarajan M (2018) Minimally Invasive Laser Gum Surgery Using Er, Cr:YSSG and Diode in Treating Periodontal Disease. Periodon Prosthodon Vol.4 No.2: 04. doi: 10.21767/2471-3082.100004. Periodontal disease is an inflammatory disease that affects the soft and hard structures that support the teeth . In its early stages this manifests as gingivitis where the gingiva will be inflamed turning red. If left untreated, this would progress and become a full-blown periodontitis where supporting tissues of the tooth and bone will be destroyed which eventually cause the tooth to fall off. According to recent findings, half of Americans aged 30 or older have periodontitis, the more advanced form of periodontal disease which equals about 64.7 million Americans . Also, this is becoming a global phenomenon. Chronic periodontitis is a type of periodontal disease that progresses over a period and more evident in adulthood. Although the bacterial infection acts as a main source of infection, the other factors that influence this condition include genetic susceptibility, age, diet, lifestyle habits (smoking), poor oral hygiene, medications etc. Since the consequences of not treating periodontal problems are major detrimental to general health such as exaggerating existing systemic conditions or potential to elicit systemic problems, it is imperative to treat this condition. Depending on the severity of the condition, there are wide variety of treatment methods available and many novel non-surgical approaches are emerging to treat it successfully. Some of the approaches include . • Extracorporeal shock wave therapy. • Electrical stimulation on osteogenesis of alveolar bone. • Biofilms and bioelectric effect. • Control of subgingival biofilm with fine grain glycine powder polishing. • Topical and systemic administration of Simvastatins. • Local and systemic use of bisphosphonates. • Use of antibiotics as monotherapy. • Replacement therapy, use of probiotics. • Use of herbs, fruits, flowers, foods to resolve inflammation and improve regeneration. • Use of stem cells. • Use of newer molecules to resolve inflammation. The purpose of this manuscript is to illustrate how one such novel approach mentioned above has been applied in a case with a chronic destructive periodontitis. A 36-years-old female came to the dental office located in Tanjore, India with a chief complaint of mobility of all teeth. The medical history was taken which revealed that this patient had no systemic conditions and a history of present illness exhibited that this patient had teeth mobility for the past 3 years with bleeding gums while brushing. Also had problems with speech and not able to eat because of the tooth mobility. Past dental history showed that this was the first dental visit in her life time. When asked about the oral hygiene habits, she explained that she brushed her teeth once in the morning every-day and did not use any other oral hygiene aids. Extra-oral examination found nothing significant (no facial asymmetry, no sign of pain or tenderness in the head and neck area and no clicking or tenderness in the TMJ area/muscles of mastication). Intra-oral examination involving hard tissue revealed that there was some decay on 17, 27, 28, 37, 38, 47 and a few teeth were missing with generalized mobility. During soft tissue examination, the gingival tissues reflected all the classic signs of periodontal problems such as gingival tissues were reddish in color, swollen, 8-10 mm pocket depth, calculus and bleeding on probing. OPG taken as an investigative procedure revealed that there was more than 10 mm horizontal bone loss. So, the radiographical diagnosis of this case was chronic generalized periodontitis. After combining clinical and radiographic signs, this case was finally diagnosed as chronic destructive periodontitis. Then, it was decided that laser treatment could be a better option here and it was done in two visits with an interval of 7 days. In each visit, after finishing SRP (scaling and root planning), the patient was lased with soft tissue laser at power of 1.4 watts with an interval of 20 mins. As the diode laser has a deep tissue penetration characteristic, the firing tip was held at a distance to direct the energy. After that, the patient was anesthetized with LIGNOX-2% (full mouth infiltration) and then lased with hard tissue laser with a power of 2.5 watts, water-11% and Air- 15%. To control the progression of disease, patient was put on antibiotics (antibiotic regimen–Amoxcillin 500 mg (1-0-1), metronidazole 200 mg (1-0-1) for 4 days). Follow ups were done at 1 week, 15 days and 2 months. Each follow-up showed some drastic improvement in bone and tissue regeneration. There was progress seen in teeth prognosis and 20% of root covered by bone. In the maintenance phase, the patient was instructed to brush twice per day, take metronidazole weekly twice and advised to do oil pulling before brushing her teeth (Figures 1-4). Figure 1 Before treatment pictures (a and b) reflecting gingival inflammation, mobility and severe calculus. 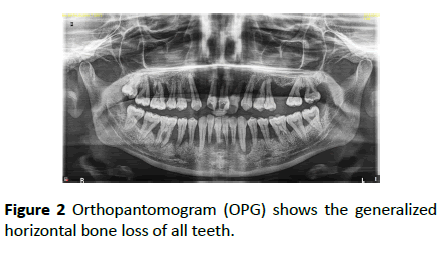 Figure 2 Orthopantomogram (OPG) shows the generalized horizontal bone loss of all teeth. 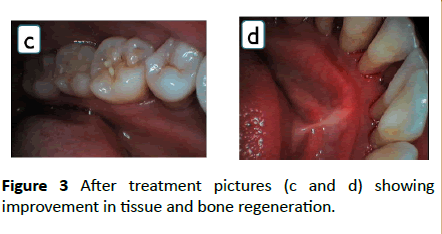 Figure 3 After treatment pictures (c and d) showing improvement in tissue and bone regeneration. Figure 4 After two months follow-up post-operative orthopantomogram (OPG) showing improvement in bone regeneration. The word Laser is the acronym for light amplification by stimulated emission of radiation  and it can be differentiated from other light sources by their coherence . When tissues are irradiated with lasers, four types of interactions may happen; Reflection, Scattering, Absorption and Transmission  and it exhibits strong ablation, hemostasis, detoxification and bactericidal effect on human body. The lasers used for periodontal treatment include Nd:YAG, diode, CO2, Er:YAG, Er,Cr:YSGG and lasers will exhibit different characteristics based on their wavelength . The reason for choosing Erbium lasers especially Er,Cr:YSSG for treating the above case is that Erbium lasers have more advantages than other lasers. Some of them include it reduces the risk of deep thermal damage to soft tissues and bone as it has a shallow penetration as opposed to Nd:YAG and diode lasers which have deep tissue penetration . In addition, Erbium lasers are very effective for removing bone as it has a high absorbance to water as opposed to CO2 lasers which also have a high absorbance to water but at the same time it has more absorbance to inorganic crystalline structures which make up the bone leading to microbio-explosion . Although Erbium laser was chosen over diode as a primary laser, Diode however, was used as a complementary to lase the soft tissue. The above laser treated case shown tremendous improvement at 2 months follow up which was confirmed both clinically and radiographically. Although laser induced pocket reduction and bone regeneration are not new, there is no sufficient evidence to prove that it is superior to traditional method of SRP and it remains controversial . This case would act like a supporting evidence for independent clinical trials that already showed similar results in treating periodontal disease using Erbium lasers. A 36-years-old female patient with chronic destructive periodontitis was successfully treated with Er,Cr:YSGG laser and Diode laser. After 2 months, there was significant improvement in bone and tissue regeneration and the patient was highly satisfied as this procedure did not cause any discomfort unlike traditional treatment methods. As there are not many documented scholarly articles on this type of cases, this report could contribute to the building up of evidences toward application of Er,Cr:YSGG and Diode laser technique in treating periodontal diseases. It can be concluded from this report that Er,Cr:YSGG and Diode laser techniques have a promising future in a wider scale treatment of periodontal diseases. American Academy of Periodontology (2018) Chicago: American Academy of Periodontology. Eke PI (2012) Prevalence of periodontitis in adults in the United States: 2009 and 2010. J Dent Res 91(10):914-920. Kumar AJ (2016) Novel and often bizarre strategies in the treatment of periodontal disease. 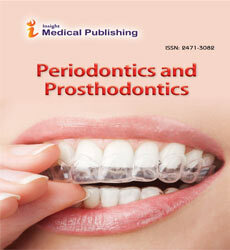 Journal of Indian Society of Periodontology pp: 4-10. Bouhout RYB (2015) Laser assited periodontics: A review of literature. World Journal of Stomatology. Kranendonk AA (2009) The effect of a pulsed Nd: YAG laser in non-surgical periodontal therapy. Journal of Periodontology 2: 1. 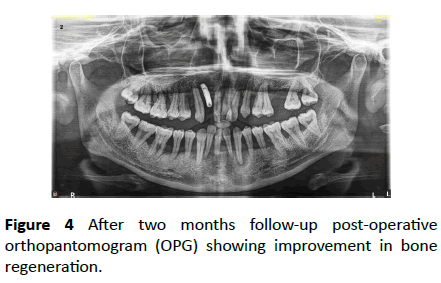 Perio DN (2013) Perodontal bone regeneration and the Er,Cr:YSGG laser: A case report. Open Dent J 7: 16–19. Dederich DN (2013) Bone regeneration. Open Dent J 2: 1. Kim HS (2017) Efficacy of laser in periodontal treatment. Lithuanian University Of Health Sciences, Medical Academy. Cobb CM (2006) Lasers in periodontics: A review of literature. J Periodontol 77(4): 545-564.